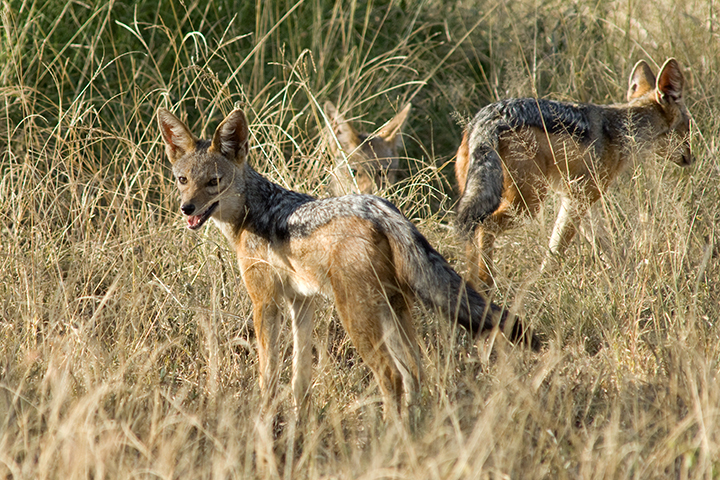 These are Black Backed Jackal that I photographed in the Serengeti of East Africa. I expected Jackals to be relatively large based on Egyptian depictions of them in art. The first time I saw one of these little guys in the wild I was surprised by how small it was. These particular Black Backed Jackals are a little smaller than a North American coyote. They have an interesting personality, though. Unlike a coyote, they are more confident and actively prowl during the day. They are surprisingly small, and very interesting to watch their group dynamics. I think I was also surprised that they tended to be in much smaller packs… at least the ones we saw were smaller than I imagined.